BEEBE, Arkansas, January 4, 2011 (ENS) – Thousands of dead blackbirds that fell from the sky in Beebe, Arkansas on New Year’s Eve died from “massive trauma,” according to Arkansas state officials. All major organs were normal and the birds appeared to be healthy, the lab results showed. Gizzards and stomachs of the birds were empty. In addition to the red-winged blackbirds, common grackles, brown-headed cowbirds and European starlings were also found dead in the streets of Beebe. Air testing showed the air over Beebe was clean of toxins. Beginning at about 11:30 pm on December 31, Arkansas Game and Fish Commission wildlife officers received reports of blackbirds falling from the sky in a square-mile area of Beebe. They estimate that up to 5,000 birds fell before midnight. Most of the birds were dead, but some were alive when officers arrived. Game and Fish officers flew over the area in a helicopter to gauge the scope of the event. They found no dead birds outside of the initial square-mile area. The Beebe City Council held an emergency meeting Saturday morning and hired U.S. Environmental Services to pick up and dispose of the dead birds on streets, in yards and on rooftops. “The flock could have been hit by lightning or high-altitude hail,” said Game and Fish ornithologist Karen Rowe. 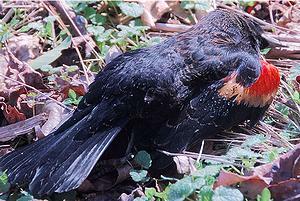 Three days after the Beebe bird deaths, about 500 red-winged blackbirds and starlings were found dead along a quarter-mile stretch of highway in Louisiana, 300 miles to the south. On Monday, hundreds of dead and dying birds lay across a quarter-mile stretch of Louisiana Highway 1 near Pointe Coupee Parish. Louisiana state officials have sent some of the dead birds to labs in Georgia and Wisconsin to obtain toxicology reports that might yield clues to the cause of their deaths. “Mass bird die-offs can be caused by starvation, storms, disease, pesticides, collisions with manmade structures or human disturbance,” says Greg Butcher, director of bird conservation with the National Audubon Society, which is monitoring the situation. Butcher said the birds that died are abundant species that flock together in large nighttime roosts during the winter months. Roosts can contain from tens of thousands to 20 million individuals or more.